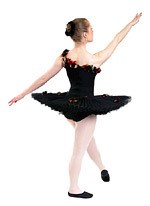 The Rosie tutu has twelve panels in the bodice, alternating in velvet Lycra and nylon Lycra, and a square neckline with a binding of sequins. The tutu has eight layers of our unique pleated net in the skirt approx. 11 iinches (28cm) long reducing to seven layers and 10 inches (25cm) long at size C1, and a full length zip fastener at the back. The Shivina tutu has a bodice with eight panels of nylon Lycra, the two in the front edged with satin ribbons, and eight layers of our unique pleated net approx. 11 inches (28cm) long reducing to seven layers and 10 inches (25cm) long at size C1. The back has a full length zip fastener and the spaghetti straps are decorated with roses interspersed with green leaves. 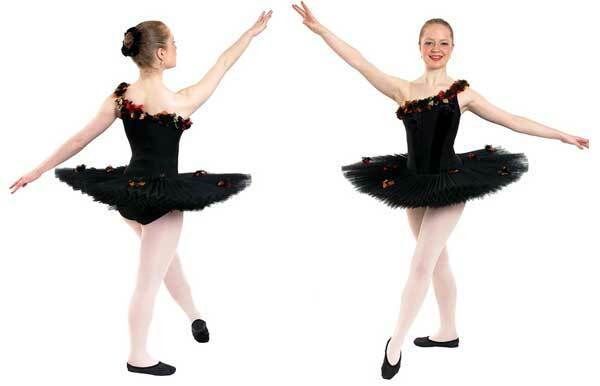 The Demisha tutu has a nylon bodice with two velvet Lycra panels in the front, the right shoulder strap is of a clear plastic material whilst that on the left and the top edge of the bodice is finished with a ribbon of silk flowers. The tutu has eight layers of our unique pleated net approx. 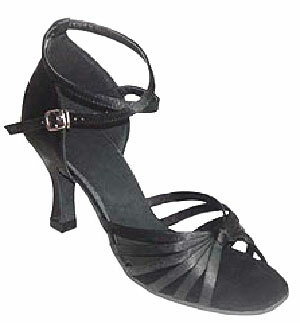 11 inches (28cm) long reducing to seven layers and 10 inches (25cm) long at size C1, and a full length zip fastener at the back. 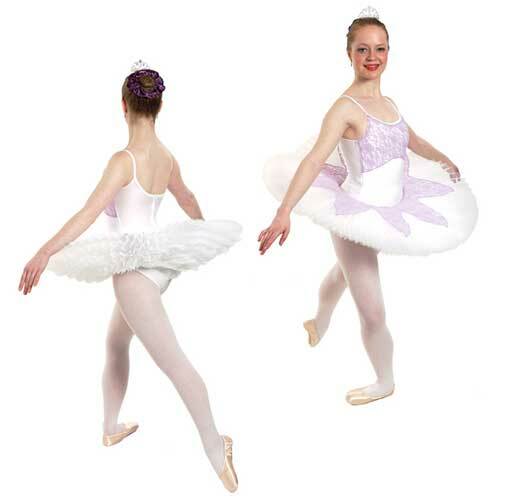 The Demisha tutu has a nylon Lycra bodice with two velvet Lycra panels in the front, the right shoulder strap is of a clear plastic material whilst that on the left and the top edge of the bodice is finished with a ribbon of silk flowers. The tutu has eight layers of our unique pleated net approx. 11 inches (28cm) long reducing to seven layers and 10 inches (25cm) long at size C1, and a full length zip fastener at the back. 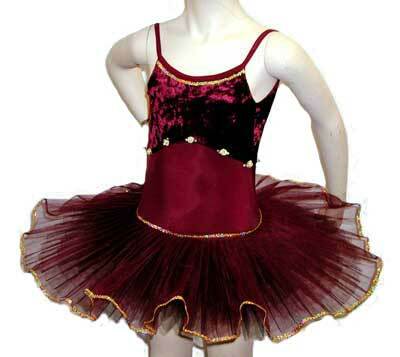 The Patricia is a two tone velvet/nylon tutu with a gathered front, long sleeves and a bi-coloured skirt. The tutu skirt has nine layers of our unique pleated net approx. 12 inches (30cm) long. 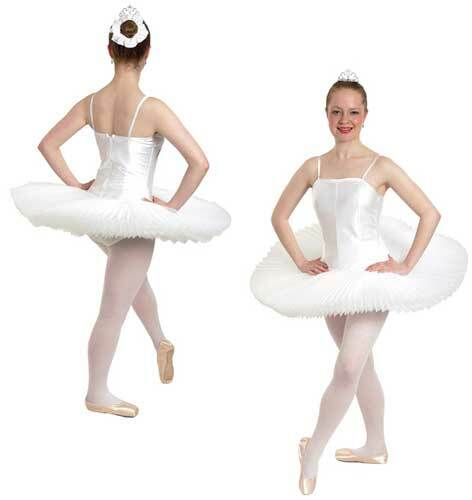 Plain white nylon Lycra tutu with spaghetti straps and pleated net, decorated with coloured lace.